Boasting a history stretching back to the turn of the 20th century, the Australian Open is Australia’s biggest tennis tournament and one of the world’s most renowned majors. Played in January each year, it is the first of the four Grand Slam tennis events and represents the major season opener. Played on the iconic blue hard-courts against a Melbourne cityscape backdrop. It’s small surprise that Australian Open draws crowds in excess of 700,000! Australian Open’s biggest matches take place in Melbourne Park’s three main stadiums – Rod Laver Arena, Margaret Court Arena and Hisense Arena. For two weeks during Summer there is no better place on Earth than courtside at the world-famous Melbourne Park to share in all the action and exhilaration of Grand Slam® tennis! 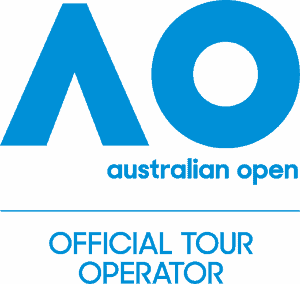 Your choice of Official Australian Open 2018 ticket(s) including Ground Session Tickets and Category 1 and Category 2 upgrades. Go to as many or as few sessions of the Australian Open as you like! A fantastic selection of quality, centrally-located Melbourne hotel accommodation options to choose from to suit every budget. Passes to iconic Melbourne activities and attractions.